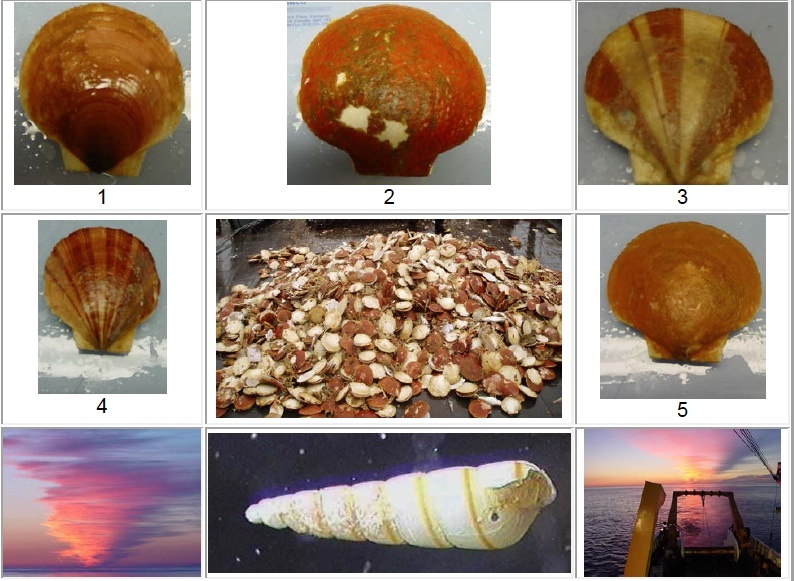 Question of the Day: Predict the mass and size of each scallop pictured above. Match them with the masses and lengths shown below. Yesterday’s Answer: Answers may be different. *Thanks to Dvora Hart, Northeast Fisheries Science Center, for supplying the scallop information. On Sunday, I was able to operate the Conductivity, Temperature, and Depth instrument by myself. This instrument is lowered into the water at every third designated stations. Data is collected as the instrument descends to the bottom. This data includes salinity (saltiness), temperature, and depth of the water. This is important since various marine animals require ideal temperatures to survive. Today’s CTD went down to 80 meters (think 80 meter sticks deep) and recorded a temperature of about 5 °C. That ‘s cold! Expect to catch the scallops, to the surface they will go. Spending fifteen minutes dragging and bringing in the keep. The aging/growth ridges on their outside’s what they tell. As we comb through our dredge piles, intent on finding scallops, one of the most prolific creatures I notice is the Hermit Crab of the family Pagurus. Hermit crabs are common on every coast of the United States and like many people, I am drawn to their special ability to take up residence in cast off mollusk shells. Just as we grow out of shoes when our feet grow, so must they find new homes as they age. When seen without their shell, their abdomen is coiled, soft and very pink. They carry their shell with them, and when threatened or attacked are able to retreat quickly for protection. Hermit crabs are highly adapted to carry around their permanent burden of a home because they have special appendages on their midsection segment for clinging to the spiral support of a marine snail shell. Their long antennae and large socketless eyes give them a distinct, non-threatening but whimsical look….and it makes me want to take one home-but of course I couldn’t offer it the same kind of home it already has. The six hour shifts for the scallop survey are taking its toll on my sleep needs. Every day I feel I am further behind and will never catch up. This morning I truly did not feel awake until about 10am, even though my watch began at 6 a.m. My daily schedule consists of the basics: eat, work, eat, relax, sleep, eat and work. I don’t know how the crew can adjust to this kind of schedule for months on end as they go to sea. It takes a very special person to adjust to the physical demands, let alone the demands of leaving family behind to come to sea. However, some of the guys on board have been doing it for 20+years! Coming to sea has a magnetic pull for some….is it the vast water and open horizons? Is it the need to assert some sort of independence? Is it the opportunity to be a part of something so much larger than one’s self? As I speak to some of the deck hands, they are generally happy to be working for NOAA and away from the uncertainty of fishing or lobstering. In part it’s having steady work not influenced by the vagaries of what is caught at sea. These days, with the Atlantic fishery recovering, the catch is more consistent. Of the two deck hands I have come to know, both have a far away look in their eye—missing some of the action on a fishing boat, but still in love with the sea. I) Officers and junior officers: Responsible for overall ship operations including: navigation, horizontal and vertical control, damage control (ship safety), medical services, field operations, etc. III) Deck operations: Responsibilities include: launch and de-launch of small boats (launches and skiffs), operation of the small boats, manning equipment and lines used during anchoring and mooring of the ship, maintenance (cleaning, rust removal, painting) and operation of the deck and deck equipment (cranes, gravity davits, hydraulic davit, the anchor windlass), etc. V) Yeoman and Electronics: Yeoman – responsibilities similar to those of a business manager (personnel, payroll, ship’s budget, etc.). This position is slowly being eliminated from the ships in NOAA’s fleet. Electronics – responsible for the maintenance and operation of the electronic equipment onboard ship (computers, radios, GPS units, etc). VI) Steward: Responsibilities include: operation of the galley, preparing three meals a day for the crew, preparing snacks for the morning and afternoon breaks, and preparing a picnic lunch and drinks to send with the three to four launch crews who are sent out on survey assignments. I was able to work with the deck crew the other day, and I’ll share the experience in a future log! Today I did a lot of housekeeping kind of stuff. 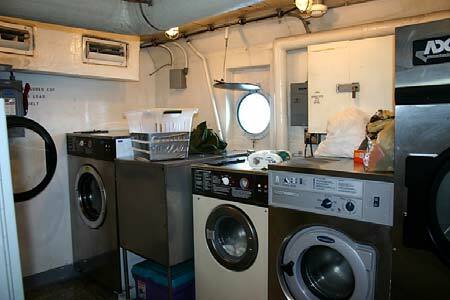 I was getting pretty low on clean clothes, so I went down and used the ship’s laundry – three washing machines and three driers. The only difficulty is trying to find open machines. Either I hit it on a busy day or 49 crewmembers and four guests keep the machines busy. I also caught up on my logs and did some background reading on tides and tidal datum. Think I will try a little fishing tonight – still haven’t managed to pull one over the ship’s side. Last night Jon, one of the crew, somehow caught a skate (looks like a ray). He hooked it in one of the fins. We pulled it up took a look at it and then released it back over the side. Very interesting! Today I took care of tasks that come with living aboard a ship as a crew member. I’ve been on board the RAINIER for almost 9 days now and my laundry started to attract sea gulls outside my room’s porthole. Even the Sei Whales turn and swim away when they approach my side of the ship. On shore, many of my students’ moms or dads do the laundry, but on a ship this becomes your responsibility. Washing clothes at sea poses special problems because we have no sewers to dispose of waste water, only the ocean. We have to use special soap that won’t harm sea creatures and limit the amount of water used for washing. The RAINIER has a full laundry with water saving washers and energy saving dryers as you can see in this photo. After laundry, I cleaned my room. The Captain expects everyone to keep a clean room and make up their beds everyday. He can even enter your room at any time for an inspection. I share a room with the other teacher at sea, Mike Laird. The room has two bunks, two closets, a head (known on land as a bathroom) and a desk with a computer as you can see here: Mike and I lucked out by getting an officer’s room, because many crewmembers share rooms with up to four people and only have gym lockers to store their gear. Once I cleaned my room and vacuumed the floor, I tackled the big job of cleaning the head. 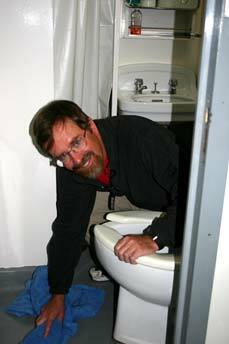 Again, you can’t bring a parent along to clean the bathroom for you and this job falls on everyone on the ship. The RAINIER does its best to protect the environment by using special cleaning products that kill mold and germs, but not aquatic life that live in the water where our wastes end up. I used three different types of cleaners: one for the tub, one for the toilet, and one for everything else. I kneeled down on my hands and knees to scrub everything from top to bottom to ensure the germs die and won’t make us sick miles from the nearest doctor. My mom and students would be proud of me! The rest of the day I caught up on my paper work and read, but tomorrow I will have a big day out on the launch. I enjoyed a day off the launches to get caught up on all my house work and work on my photography. My cabin had gotten messy after spending eight nights in it and I look forward to sleeping on clean sheets tonight. I met with Larry Wooten, Chief Electronics Technician, and learned how to transfer my photos over the ship’s file server. The ship’s crew is one big family and share many things. Several people have put their photos on the main server so others can enjoy and download pictures. Everyone trusts each other on the ship. We leave our doors unlocked and you can leave your wallet out on the table without a worry. I wish our society back on shore could be just as trusting. Well, I’m off to find some salmon off the back end of the ship. Why is it important to keep a ship at sea so clean? What happens if someone on a ship becomes sick? Question of the Day: What physical adaptations help the animals pictured in numbers 1 – 6 above survive in their environment? Give at least three. Yesterday’s Answer: The cloud types shown in yesterday’s pictures are: 1) cirrus and stratus 2) stratus (fog) 3) cirrus 4) cirrus 5) cumulus 6) cirrus and stratus 7) stratus (fog) 8) stratus 9) cumulus (alto-or cirro-cumulus) There were no cumulonimbus (thunderstorm) clouds (which is a good thing). The crew on the Albatross IV was experiencing FAIR weather. Animal adaptations fall into two general categories – behavioral and physical. The physical adaptations are the structures on the animal that help in survive, while the behavioral adaptations are the actions the animal takes in order to survive. The structures may include fins, body shape, beaks, mouth parts, legs, gills, etc. that are important to the animal’s ability to endure within the habitat. For example, scallops have a hard shell that helps them survive by keeping out predators. The actions that animals may take in order to survive include playing dead, showing teeth, and licking your face. For example, scallops squirt water in order to push themselves away from their predators. On Saturday we moved into Canadian waters and are now operating in an open area. 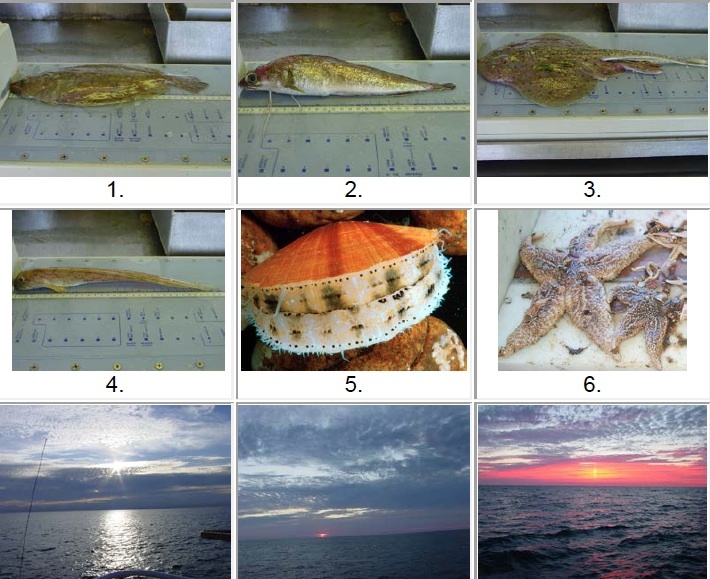 We essentially have the same tasks to perform at each station, including taking a picture of the catch before it is sorted, weighing and measuring selected species, tagging and bagging requested species, cleaning the workstations after each station, and operating the CTD. More information about the Conductivity, Temperature, and Depth instrument will be shared in tomorrow’s log. Several whales, dolphins, sharks, and porpoises have been spotted. They are difficult to photograph because I never have a camera ready, and they are breaking the surface at unpredictable time. 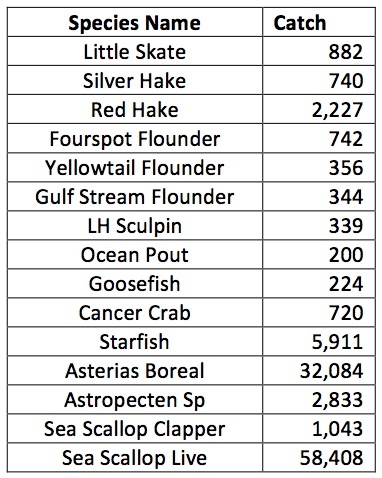 The table below shows the amount of some of the marine species collected since our survey began. Can you tell which species was the most populated in the areas surveyed? Which species was the least populated? Are there any that have the same or close to the same amount? What’s the difference between the number of the most and least populated totals? Awash in orange and red and yellow, it is hard to forget. Its splendor in the many colors that it will show. Now I lay me down to sleep. . ., I ask of Him, I pray. What kind of crab makes its home in an abandoned snail shell? Answer to yesterday’s question: Lines- a word used on a ship meaning ropes; Bosun- a very old word derived from “Boat Swain”- meaning the lead fisherman; Steam- the distance to be traveled on a ship from one destination to the next; Swell- wave action –when the action is greater, the difference between the tip of the wave and the trough represents the swell. I would like to add some clarifying information to my log entry, Mike Laird, July 29, 2005. In that entry, I discussed setting up two horizontal control-data collection stations, and in reading the entry, it appears that the purpose for both stations is to support the “fly-away” Differential Global Positioning System (DGPS). This is not accurate. Only the station we established on the point will be used to determine the exact location of the DGPS. The purpose of the other station is to verify the accuracy of the existing benchmark at that site, so a tidal datum (“…a base elevation used as a reference from which to reckon heights or depths”) can be established for the tide station located there. I mentioned in the previous log that the horizontal control team is responsible for establishing accurate latitude and longitude coordinates for each sounding taken by the RAINIER and the launches. In addition, the soundings are taken throughout the day at different stages of the tide, which means that water depth will vary. It is the responsibility of the vertical control team to provide precise tide data for corrections that have to be applied to the soundings so that they meet NOAA’s Mean Lower Low Water (MLLW) guideline (ensures minimum water depth is charted). Mean Lower Low Water means that an average is taken of the tide level at the lower of the two ebb periods in a semi-diurnal (two flood periods and two ebb periods every day) tidal day. The National Water Level Observation maintains primary control stations in many locations around the United States. These stations determine a tidal datum based on the average of observations over a nineteen-year period. In many survey areas, the tidal datum received from a primary control station can be used to make the necessary corrections to the soundings. However, the nearest station to the RAINIER’s current work area is located in Sand Point – a significant distance away. Therefore, the vertical control team established the tertiary tidal station (one in operation for at least thirty consecutive days but less than a year) here in Cushing Bay, so that data more indicative of the local conditions can be collected and compared to the primary datum. During this analysis, a decision will be made about any adjustments that need to be made to the primary datum before it is used to make corrections to the survey soundings. Our good fortune continues to hold – the weather is incredible. Sun is shining brightly, temperature in the low 70’s. We had been hearing whispers since lunch of a beach party tonight. The rumors were confirmed by an announcement following dinner that a skiff would be ferrying people to the shore and back from 18:30 until 23:30. It was a time for the crew and guests to relax and hang out, enjoy a big driftwood bonfire, do a little beachcombing (the captain found a large whalebone – rib maybe), have some sodas and listen to a little music. A lot of fun!